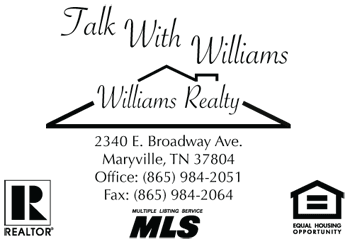 Williams Realty has been one of Blount County's leading real estate firms consistently over the past 38 years, as well as, one of the oldest locally owned real estate companies.Bud Williams, owner, started the firm, located at 2340 East Broadway Avenue in Maryville, on June 1, 1971. Williams Realty has 14 agents working fulltime to serve Blount County. They are all experienced and knowledgeable professionals in their field. The firm also offers rentals, appraisals and market analysis for property owners.The agents and staff have all been actively involved with community programs including but not limited to, United Way of Blount County, Dogwood Arts Festival, Muscular Dystrophy, Boy Scouts of America, Blount County 4-H Clubs, Chamber of Commerce and most are or have been involved with their churches and/or school groups. Williams believes the secret to success is making people happy with what they need and want. Honesty, good service and knowledge of up-to-date laws and rules of the real estate business keep the firm going. If people are happy and satisfied you will have referral business. People tell 25% of other people when they're happy with a company or agent and 75 % of people are told if they're not happy with a company. The company has guided countless buyers through the complicated and often stressful process of buying or selling their home. Customers need someone who has knowledge in the transfer of property ownership and who knows how to get loans approved at the best rate. Using a REALTOR can help customers avoid the costly pitfalls people run into when not using a professional. Over the years, having agents belong to the local Blount County Board of REALTORS has been a priority stressed by the office management. Much encouragement is given to agents to attend monthly meetings and/or serve on the Board of Directors or committees. Bud Williams, the owner, has served as President, on the Board of Directors and served on most committees. Other agents have served at various times and some are presently serving on the board. Williams said, "I believe in our local REALTOR board and will stand behind it. When we support the board as a community, we are representing what Blount County has to offer."